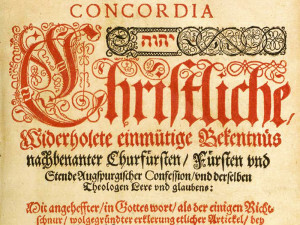 Both articles, the seventh as well as the eighth, were incorporated in the Formula of Concord in order thoroughly to purify the Lutheran Church from Reformed errors concerning the Lord’s Supper and the person of Christ, which after Luther’s death had wormed their way into some of her schools and churches, especially those of Electoral Saxony, and to make her forever immune against the infection of Calvinism (Crypto- Calvinism)–a term which, during the controversies preceding the Formula of Concord did not, as is generally the case to-day, refer to Calvin’s absolute decree of election and reprobation, but to his doctrine concerning the Lord’s Supper, as formulated by himself in the Consensus Tigurinus (Zurich Consensus), issued 1549. Note that Article VII and Article VIII ultimately deal with the errors introduced by the subtle infiltration of Calvin’s teaching concerning the Lord’s Supper into the teaching of the Faith in Lutheran parishes. 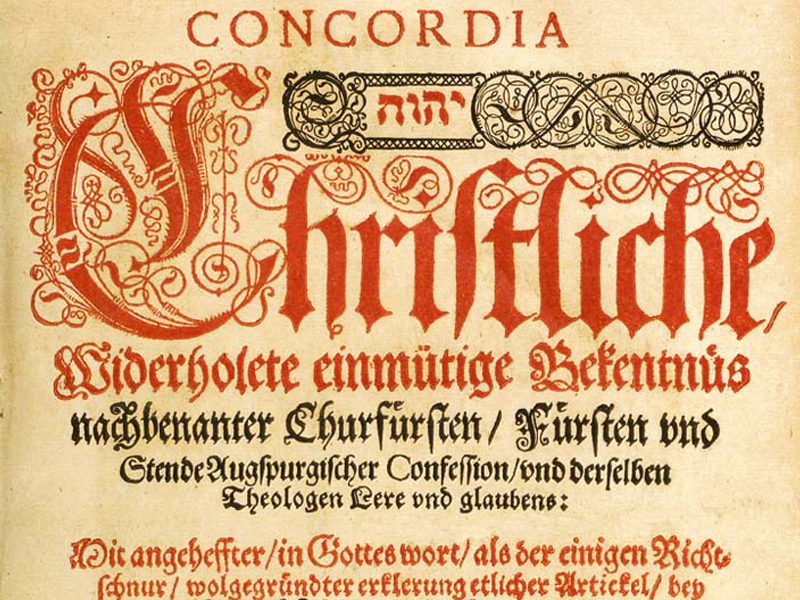 This controversy caught up, amongst other Lutheran teachers, none other than Philip Melanchthon (after Luther’s death). 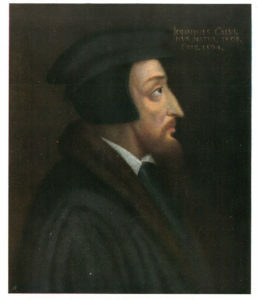 The Seventh Article teaches the real and substantial presence of the true body and blood of Christ; their sacramental union in, with, and under the elements of bread and wine; the oral manducation or eating and drinking of both substances by unbelieving as well as believing communicants. It maintains that this presence of the body and blood of Christ, though real, is neither an impanation nor a companation, neither a local inclusion nor a mixture of the two substances, but illocal and transcendent. It holds that the eating of the body and the drinking of the blood of Christ, though truly done with the mouth of the body, is not Capernaitic, or natural, but supernatural. It affirms that this real presence is effected, not by any human power, but by the omnipotent power of Christ in accordance with the words of the institution of the Sacrament. Note that 2 kinds of Sacramentarians are defined here: Those who are open about their opinion that the elements in the Lord’s Supper are purely symbolic, and those who profess to believe that there is a true presence of Christ’s body spiritually through faith. What do people often mean when they say something is “spiritual”? 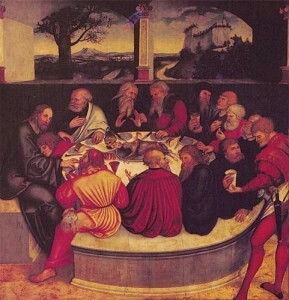 What are the Sacramentarians (both kinds) denying is present in a solely “spiritual” eating of the Lord’s Supper? What makes Christ’s Body and Blood “spiritually” present for the Sacramentarians? Therefore, what do unbelievers receive in the Lord’s Supper according to the Sacramentarians? According to Augsburg Confession, Article X, what is truly present and distributed to those who eat and drink in the Lord’s Supper? According to the Small Catechism, what is the Sacrament of the Altar (Can you recite it from memory)? What are some of the other documents and authors cited in the section that you skimmed? Upon what foundations are all these confessions of the Lord’s Supper based? Read Solid Declaration VII, par. 43. 3. We find our trust and confession of the Lord’s Supper in the words of Holy Scripture. Read Genesis 22:1-18. Was God’s instruction to Abraham a reasonable command? What was God asking Abraham to believe about Him as He gave this Word? 4. Read Matthew 26:26-28; Mark 14:22-24; Luke 22:19-20; 1 Corinthians 11:23-26. Are Christ’s words, grammatically speaking, clear? Read Solid Declaration VII, par. 48-51. 5. In the passages about the Lord’s Supper above, what words do you see repeated each time? What phrases? Read Solid Declaration VII, par. 52-54. What do we learn about the Lord’s Supper from 1 Corinthians 10:16? Is the Supper confined only to the particular meal and time of Christ’s institution, or does the communion of Christ’s Body and Blood continue even to this day? 6. Read Solid Declaration VII, par. 61-65. What are the two types of eating of the Lord’s Supper? What passage is cited for revelation of the first type of eating? If this spiritual eating is not present, is it helpful or harmful to the eater? Why? What is lacking? What is still present even when this spiritual eating is absent? What passages of Scripture and specific words of Christ support the second type of eating? What final statement of Christ in the Words of Institution command again the first type, the spiritual eating? 7. Read Solid Declaration VII, par. 74. To what is the true presence of Christ’s Body and Blood credited? 8. Read Solid Declaration VII, par. 75, 79-85. What must be done with the Words of Institution in the administration of the Holy Sacrament? What must be done with the elements of bread and wine? What must be done with Christ’s body and blood? Read par. 84 again. List out the 7 actions in the Sacrament of the Altar. Read Solid Declaration VII, par. 91-106 in preparation for the study of Article VIII, which covers the two natures of Christ in greater depth and detail. The Rev. Michael Schuermann is pastor of Good Shepherd Lutheran Church in Sherman, Ill.